PUNE: The city registered a 9.59% increase in the number of road accidents in 2017 over the previous year. While every other city in the state managed to make its roads safer in 2017 as against 2016, Pune was the only one where the number of accidents had gone up. Puneites can draw some solace from the fact that the number of fatalities in these accidents declined by 9%, though the number of injuries increased by 11.39%. Moreover, the rise in the number of accidents in Pune comes after a declining trend seen over three successive years from 2013 to 2016. The rise in the number of road accidents in the city is fuelled by rash and negligent driving as well as over speeding. 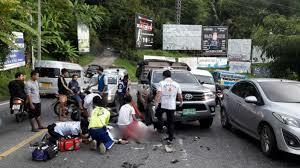 The increasing number of vehicles and the corresponding poor road infrastructure, along with the growing tendency among motorists to violate traffic rules, are seen as the other contributing factors. District- and city-wise statistics released by the office of the additional commissioner of police (traffic), Fort, Mumbai, showed that Pune was the only city among the nine police commissionerates in the state where the number of accidents has increased. The remaining eight cities, including Nashik, Mumbai and Aurangabad, have shown a decline over the last two years. Nashik, in fact, registered the biggest drop (39%) in the number of accidents in 2017 as compared to the previous year. Senior police officials, however, pointed out that barring Mumbai city, the Pune police commissionerate, which is spread over a vast 730 sq km area, has a much larger jurisdiction compared to other cities. Pune has also witnessed an unprecedented growth in the construction and industrial sectors. This has resulted in greater movement of heavy vehicles, including earthmovers and multi-axle vehicles, on the roads. Moreover, five major highways connecting Mumbai, Satara, Solapur, Ahmednagar and Nashik pass through the city.